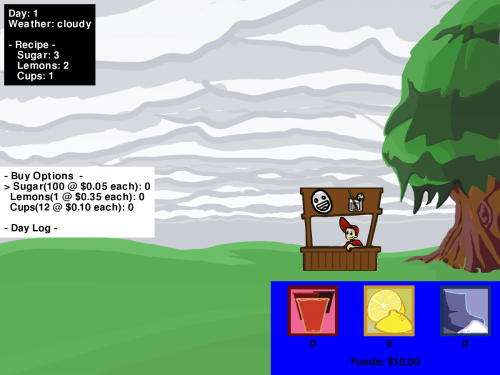 This is your basic "Lemonade Stand" style game, where the player manages a lemonade stand (or similar such store) and tries to make as much money as possible. The game is designed to incorporate money and fractional math skills to teach basic operations. Localization will be implemented in the final phase, with the stand being written to use more regional ingredients and products. Any interest in helping can be directed towards project leader Nathaniel Case as well as any of the other listed active members. Lemonade Stand is to be considered an open project, which is currently undoergoing active development for the RIT fall quarter 2010. Nathaniel will continue to have interest in the project and will continue to provide assistance and input as time allows beyond this time. 1.1.0(git tag): Updated game code. Supplies are purchased and plans are made for the day. A recipe may be chosen if more than one is available. Customers queue at the stand and buy lemonade. Profit is calculated by the player and 'put away'. Once the digest has been displayed, the game returns to morning again. Prices are fixed at multiples of 25 and products yield more money per sale. We're looking to create a workable prototype with the ability to buy materials and sell a product.However, the most important goal is to have a working game. While possibly not feature complete, the game should have basic functions working. 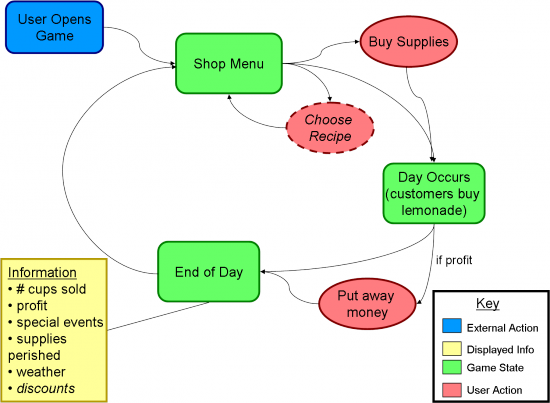 Advanced mode: changing the recipe for your "lemonade"
Choosing location of Lemonade Stand within the town, would influence sales, cost of supplies, etc. One of the things we always need are new random events to make the game more interesting. Another thing which is always useful is submitting new artwork. Localization is likely to be a big problem in this game. Not simply translating the words, but also translating the idea, ie. finding out what kind of shop would be reasonable to open in a country, what it might stock, etc. This becomes even more difficult when moving to a graphical environment. For every localized region we will need a different set of graphics depending on what the stand is selling. 4.N.6 Exhibit an understanding of the base ten number system by reading, naming, and writing decimals between 0 and 1 up to the hundredths. 4.N.10 Select and use appropriate operations (addition, subtraction, multiplication, and division) to solve problems, including those involving money. If you don't have pygame, then download and install it from pygame. From the Welcome Screen - Enters the game. From the Main Screen - Enter the store. From the Store Screen - Complete transaction, Leave store. From Daily Log - Submits values entered. From the Store Screen - Left and right arrows select a product. From Daily Log - Up and down arrows select a monetary value (dollars, quarters, etc). Number Keys: From the Store Screen - Used to enter the desired quantity of the selected product. From Daily Log - Used to enter the number of dollars, quarters, etc. which make up your profit. <h>: From any screen - Causes a help message to appear or disappear. <ESC>: From any screen - Exits the game. This page was last edited on 12 August 2011, at 13:48.